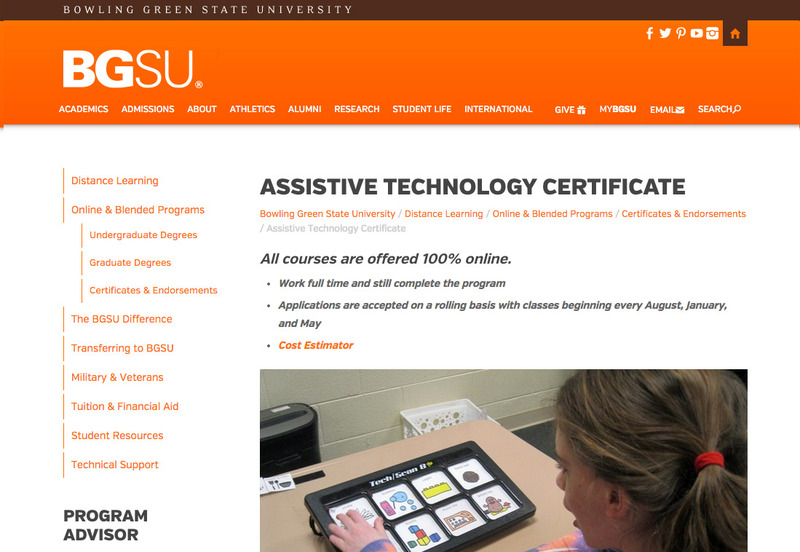 Bowling Green State University Assistive Technology Certificate Program A fully on-line program consisting of 5 graduate-level courses for a total of 15 credit hours of study. 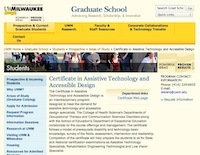 The program is designed for teachers and other professionals who would like to develop expertise in supporting students by using assistive technologies. 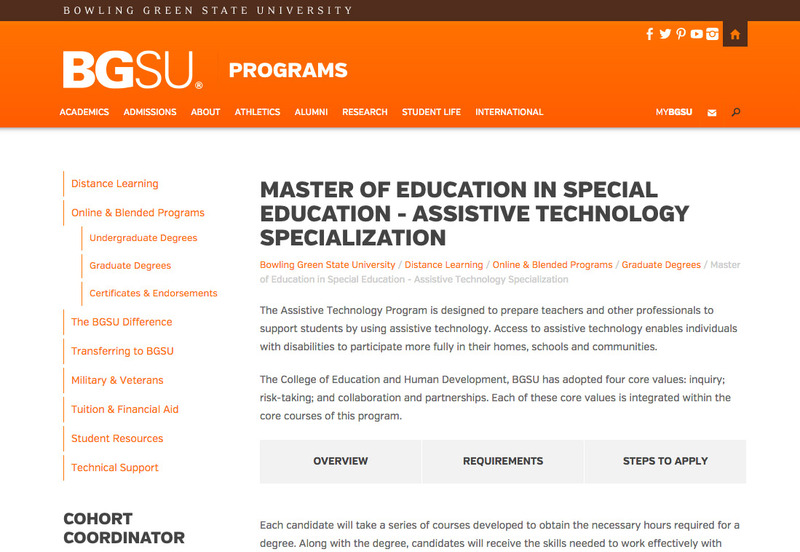 The program is appropriate for special education teachers, related service providers, rehabilitation specialists, psychologists and administrators. 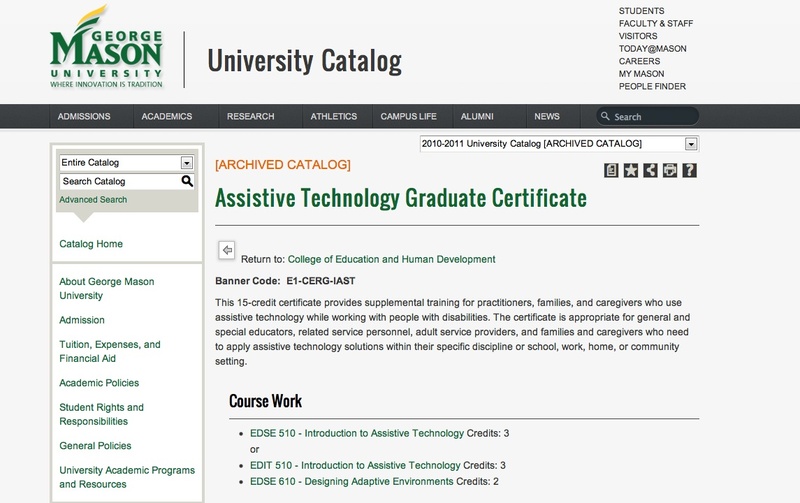 Coursework consists of 15 credit hours of classes that can be taken online. These courses are offered year-round on a trimester schedule. 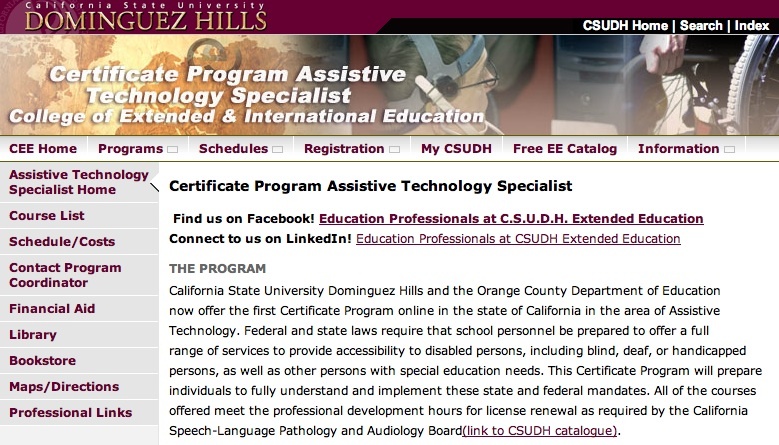 An added benefit is that the courses offered through this program meet the professional development hours for license renewal as required by the California Speech-Language Pathology and Audiology Board. The ATHS program prepares students to synthesize connections between humans and technology and to interpret product design and function, assess an individual's AT needs and apply legal and best practice protocols. 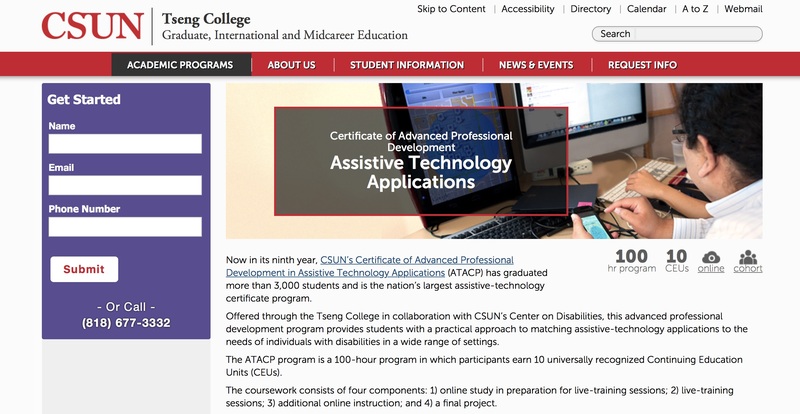 This is a 100% online program that results in a master's degree in assistive technology. The coursework takes 2 years to complete and students work within cohorts to foster group work and camaraderie throughout the program. 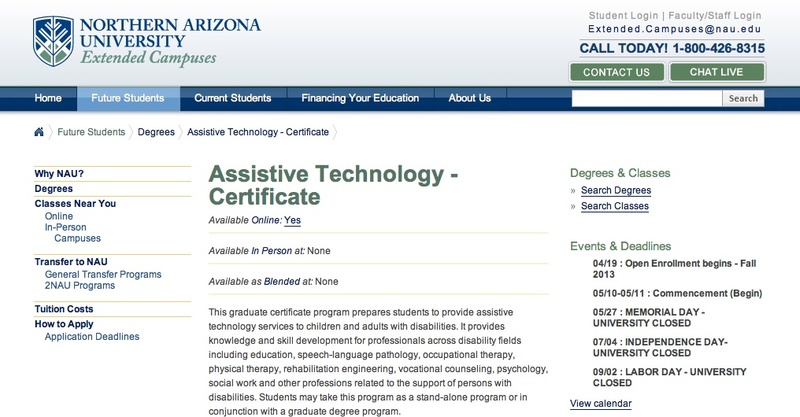 A bachelor's degree is required for admission to this program. An advanced professional development program that provides students with a feature-matching approach for identifying AT needs and appropriate AT solutions. This is a 100-hour program that results in 10 CEUs. Coursework consists of online study, live training sessions and a final project. There are two options for completing the coursework. Standard: 60 hours online, 32 hours live training. FastTrack: 76 hours online, 16 hours live training. 8 hours final project (for either the Standard or FastTrack option). 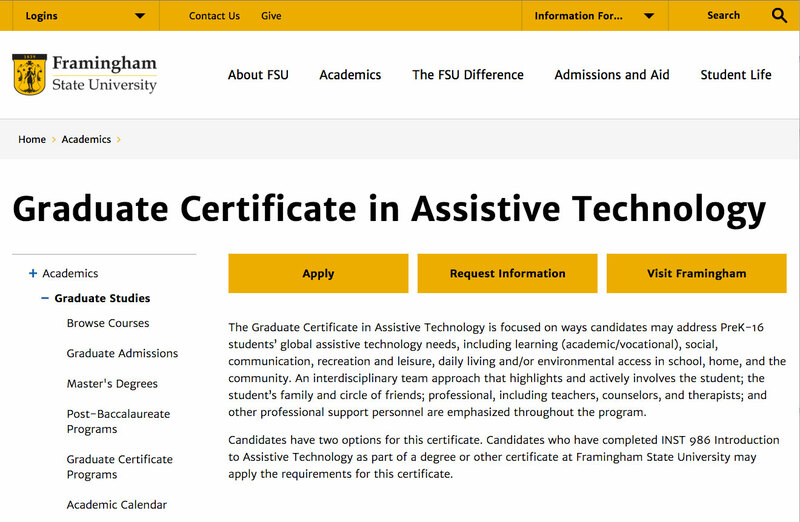 The Framingham State University program offers a blended option of both online and face-to-face courses to complete the four courses required to obtain a graduate certificate in assistive technollogy. 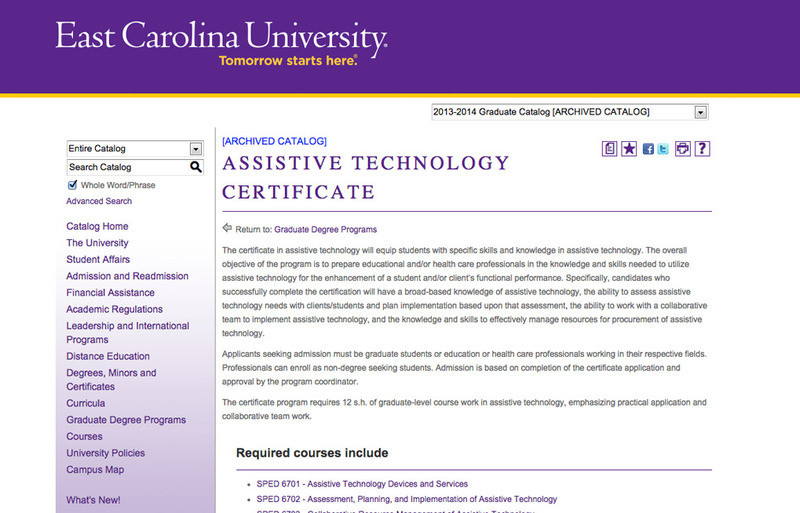 There is also a five course option to obtain a graduate certificate in assistive technology with advanced internship. This 12 credit hour program can be taken entirely online or through a combination of online and lab-based courses at the University of Illinois at Chicago (UIC). 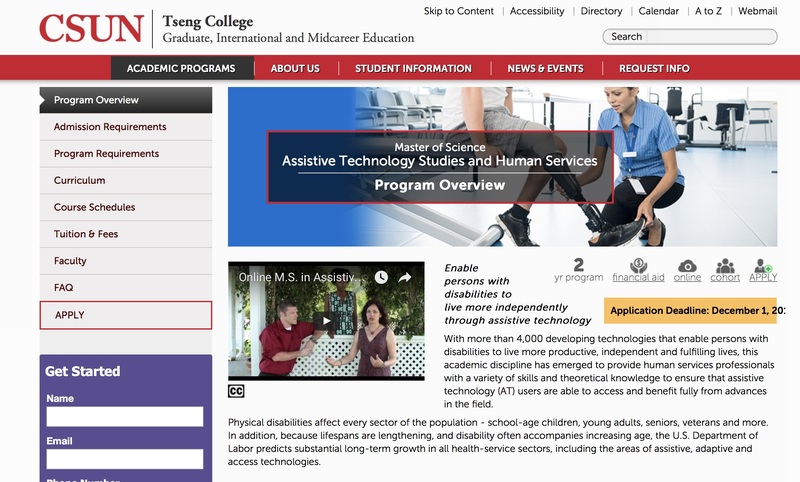 The program trains working professionals and administrators to deliver AT clinical services to individuals with AT needs in the areas of occupational or physical therapy, speech language pathology, engineering, special education and vocational rehabilitation. 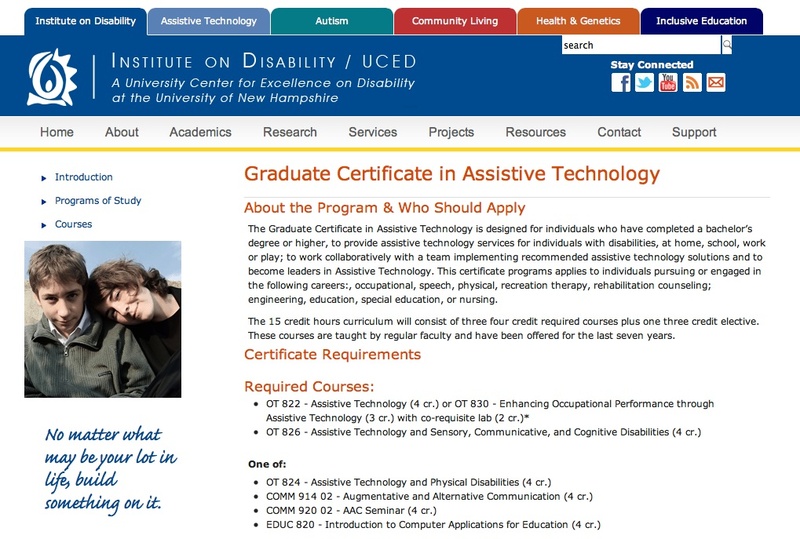 This program is designed for individuals who have completed a bachelor's degree or higher to provide AT services for individuals with disabilities. It is appropriate for related service providers, rehabilitation counselors, educators, engineers and nurses. Coursework consist 15 credit hours of on-site coursework. 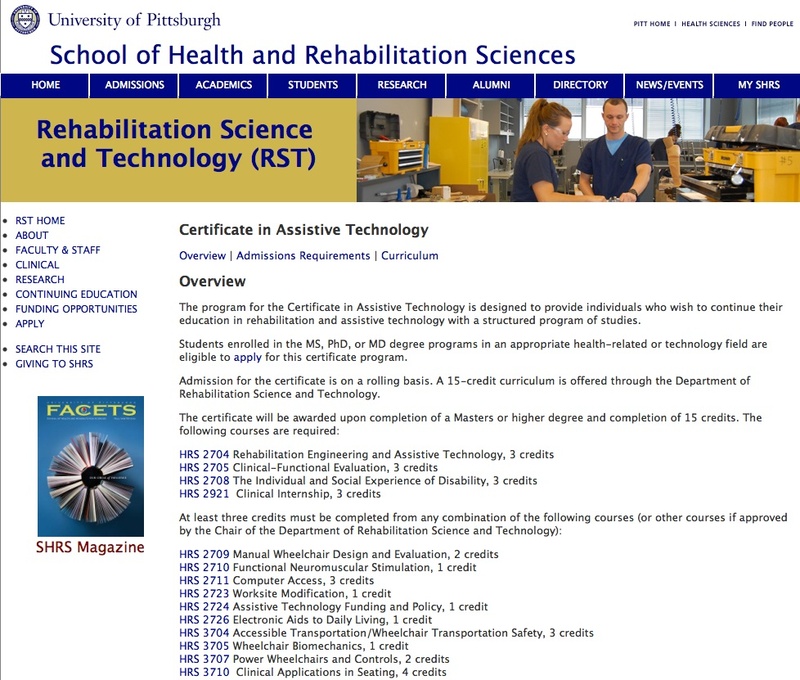 This program is designed for individuals who wish to continue their education in rehabilitation and assistive technology. To be eligible for admission, students must be enrolled in an MS, PhD, or MD degree program in an appropriate health-related or technology field. Coursework consists of 15 credit hours offered on-site. 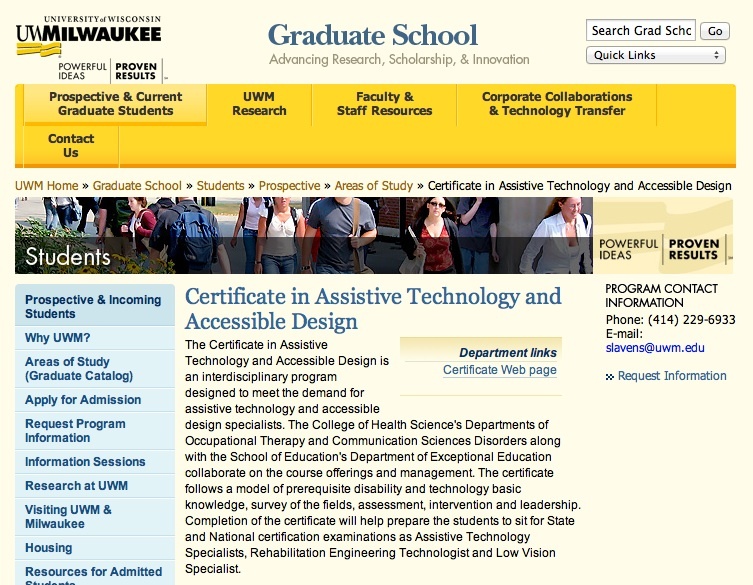 This is an interdisciplinary program designed to meet the demand for AT and accessible design specialists. 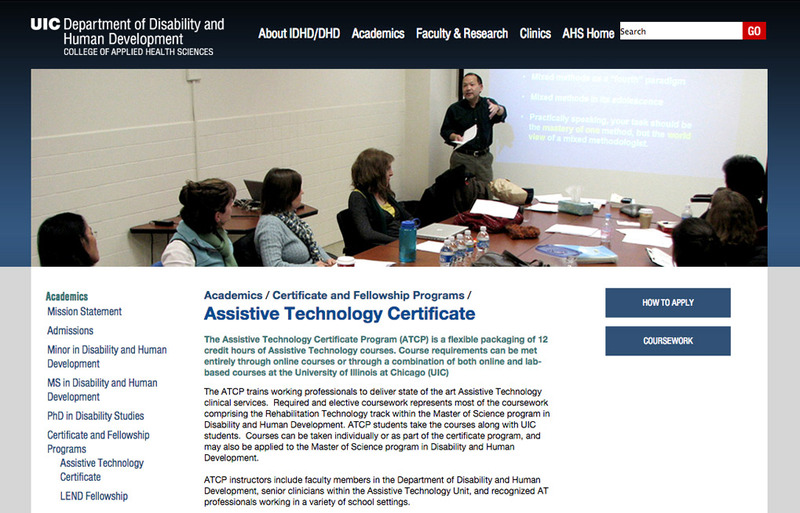 It is geared toward anyone interested in increasing their knowledge of AT. They must have an undergraduate degree with certain coursework and grade requirements. The certificate program consists of 15 credit hours of coursework offered on-site, online or a combination of both. 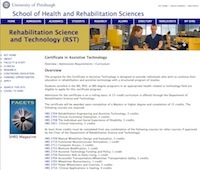 Successful completion of the certificate program will help prepare students to sit for state and national certification exams as AT specialists, rehabilitation engineering technologists and low-vision specialists.